Attaching your comments to specific parts of a document makes your feedback more clear. If someone else is commenting on the document, replying to their comments lets you have a discussion, even when you're not all in the document at the same time. Type your comment. If you want to make changes to any of your comments, just go back and edit them. Practice with comments and other collaboration features in Word by downloading this Collaborate in Word learning guide. Right-click the comment, and choose Delete Comment. 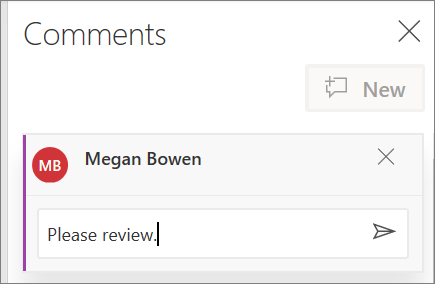 To delete all the comments in the document, go to the Review tab, click the down-arrow on Delete, and choose Delete All Comments in Document. Select the text or graphics you want to comment on. Type your comment, and select Post. Bubbles in the margin indicate where someone has left a comment. 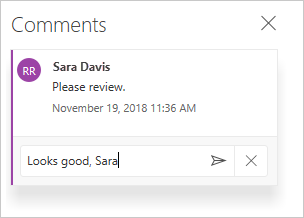 On the Review tab, select Show Comments to display all comments in a document. Select Previous or Next to jump to each comment. To respond to a comment, click the comment, and select Reply . To dim the appearance of a comment, click the comment, and select Mark as Done . To delete a comment, click the comment and select Delete .